Hello, Mediafire kya hai? and Internet per Kisi Bhi file ex-audio, video, app, document, picture, and other bahut Kuch ko kaise upload kre.aaj hum iske bare me is post me ache se explain krne wale hai.inhi 2 topic ka aapko is post me fully explain milega. Hey, guys aaj ki post me hum batane wale hai ki mediafire kya hota hai or iska use kaise hota hai.friends agar aapko iske bare me jan an hai to full post ko read kijiye.is post me aapko mediafire ka fully explaination milega. Mediafire ka mean aisa place jaha hum kisi bhi file ya other document ko internet ki duniya me dal shakte hai. Hamare dwara internet per dali gayi file online ho jayegi. mediafire platform "Large file transfer" kuch hi second me upload kar deti hai. Mediafire ek bahut hi popular platform hai. Mediafire per daily lakho log is per visit karte hai.Yaha paltform baut hi trending hai. Mediafire ko august 2006 me country- "the woodlands, Texas and united state me build kiya.Mediafire ke branch(Mukhyalyan) Shenandoah, Texas and united state me build kiya hai. Internet per kisi bhi file ko upload kaise kre? Is me hum sikhenge ki kisi bhi file ko internet per online upload kaise krte hai.internet ek aisa jal hai jo ek second me million of website ko control krta hai.sabse pahle file upload krne ke liye humko "mediafire" me ek account create krna padega. Rule 1. Is " Click here" button per lcik krke medifire account create kar lijiye. Rule 2. Iske baad aapke samne ek new screen open hogi, ab jiske baad side bar me sinup and login ke button dikhai dege. agar aapka pahle se registered user hai to login kre. New user singup button per click kijiye. Rule 3. iske baad aapke samne 3plan aayenge, aapko free plan select krna hai. Rule 4. Iske baad register screen open hogi. Isme aapko apna first name - last name - email id and password carefully fill up kre. Ab niche create account per click krna hai. Ab aapke gmail per activation mail recieved hoga. Recieved email me blue link per click kre. iske baad aap login kijiyega. 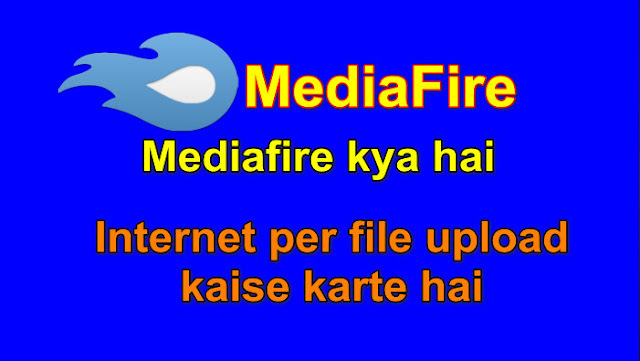 Mediafire me login hone per upload option show hoga. Upload option per click kar apni file ko upload kar shakte hai.